WHY BLUETREE COMPRESSION SOCKS A GREAT VALUE BUY?RECOVER FASTER, FEEL BETTER,GO FARTHER, LOOK GREAT. - 85% Nylon providing 360 degree stretch and flexibility,Superior Material,Thin yet, lasts longer! COMPRESSION SOCKS- At times, Compression socks are viewed as medicinal products. We intend allay this myth by combining fashion, technology and science to bring you the triple comfort. 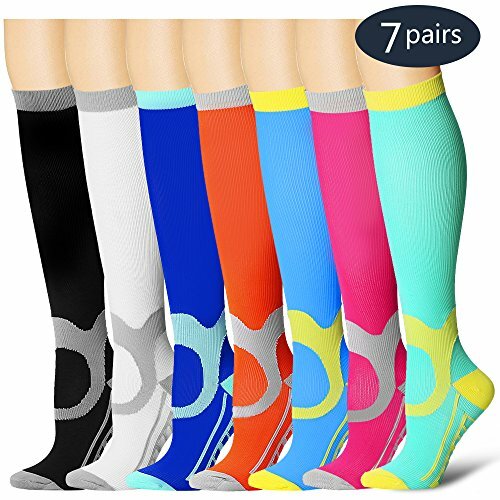 Our compression socks Improves poor blood-circulation by providing the right amount of varied compression-levels on Heel,Relieves leg pain,Stop suffering. It offers the most comforting relief without even one noticing it. Ideal for those who sit for long period during travel or at work. Special Knitted design - Our socks leverages unique and ground breaking intersecting weaving methodology which is better than compressed socks available in the market today. Our socks leveraging this process, provides better fabric strength while retaining softness, flexibility and enhanced air permeability highly suited for compression process. The pack of 7 is perfect for a whole week even if you wear one a day. it is ideal for those who sit for long period during travel or at work. PHYSICIAN DESIGNED - Our compression socks are recommended by doctors and preferred by trainers,The reinforced/cushioned heel and toe support provide unmatched comfort, Helps reduce fatigue and swelling in your lower leg.We carefully designed and manufactured our compression socks to provide premium support, comfort, and relief without compromising your mobility. Form fitting, lightweight, and breathable fabric features maintain joint stability regardless of activity.